When it came time to buy a stroller for our first baby I was overwhelmed with all the options. I ended up borrowing a Mountain Buggy Urban Jungle from a friend in a try-before-you-buy scenario while I tried to make up my mind. Turns out I couldn’t give it back; that Mountain Buggy is nine years old now and still going strong. For the next round of mums feeling overwhelmed by the stroller selection out there, let me tell you that you will not regret purchasing a Mountain Buggy, especially now that the Luxury Collection has been released. The popular Urban Jungle style has been updated with fresh and fashionable colour options and it is more user friendly than ever. The name Urban Jungle is synonymous with the philosophy behind Mountain Buggy; their strollers are engineered for the mountains and designed for the city. Mums love the simplicity and adaptability, dads love the manoeuvrability and durability and kids stay comfy for any type of city or off-road adventure. Leading a world class field in strollers, Mountain Buggy has been a firm favourite with parents for more than 20 years now, but they are forging forward with an exciting evolution of their brand. The Luxury Collection comes as the result of listening to parents’ feedback. They now boast superior one hand fast fold with automatic frame lock, a smaller compact stand fold size, newly convenient located handbrake and a refined aesthetic styling. The result is a smarter, more intuitive and more relevant stroller for today’s parents that doesn’t compromise Mountain Buggy’s high standards. New colour options are the most noticeably different feature of the Luxury Collection and both designs are simple, elegant and unisex. I can’t go past a good nautical theme and the navy and white striped canvas fabric on the silver aluminium frame complemented with tan leather handle and grab bar, labels and harness pads is an easy win for me. The pepita version features houndstooth and black contrast soft canvas fabrics on a black aluminium frame, and is complemented by black leather handle and grab bar, labels and harness pads. Adaptability is another big innovation in the luxury collection. Babies can go from a full recline to upright seat and every option in between with this pram. Should you prefer it. there are two additional seat styles that are interchangeable on the same frame – an infant car seat and the new carrycot plus. The carrycot plus is an exciting addition to the Mountain Buggy accessories. It is available in the new fabric patterns and has three versatile parent-facing ‘modes’; it can lie flat, on an incline (perfect for babies with reflux) and comes with a separate fabric set so that the carrycot can be transformed to be parent facing. It can seat babies up to 15 kilograms so this really increases the longevity of the product. As an added bonus, the Urban Jungle Luxury Collection buggies all come with matching satchel, change mat and bag clips. 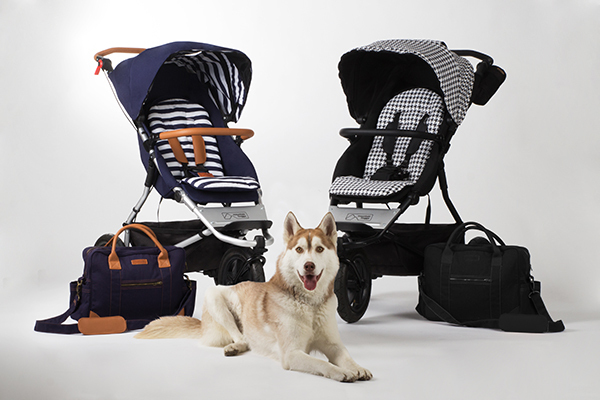 The Mountain Buggy Luxury Collection is now available at all good baby specialist stores. The Mountain Buggy Urban Jungle and carrycot plus bundle retails for $999. Follow Mountain Buggy on Facebook to keep up-to-date with their latest info.